Now that Paprika 3 has been released on iOS, Paprika 2 no longer shows up in the search results in the App Store. However, you can still reinstall Paprika 2 by looking in the Purchases section of the App Store. iOS 9/10: Go to the App Store, select the Updates tab, and then tap on Purchased at the top. Then scroll down to Paprika Recipe Manager and install from there. iOS 11/12: Go to the App Store, select the Updates tab, and then tap the user button in the top right corner. This will bring up your account information. From there, tap on Purchased. 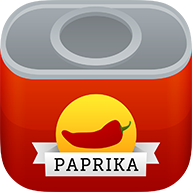 Then scroll down to Paprika Recipe Manager and install from there.